I was a bit iffy about yesterday’s post. In fact, I actually wrote it last week and just got around to posting it because I was nervous for some reason. I suppose I should know better by now, because you all have only ever been supportive and once again you proved to be, by assuring me we all make mistakes and that negative self-talk is something many of us struggle with. Here’s to continuing some self love with a party to celebrate all the good things I eat after a long run day. And let’s not forget that that long run turned out to be a mile longer than expected. I think I owe myself a celebration. Thanks to the lovely Jenn for hosting the WIAW party every week and making Wednesdays a little brighter! 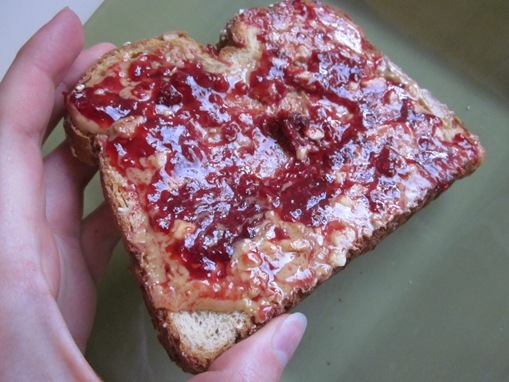 Toast with peanut butter and freezer jam. This is my pre-run staple as of late. Okay, it’s just my staple in general. Yesterday, it was my post-nap snack and who knows where it will show up today, but I’m guessing it will show up. It’s funny, I remember having to wait for hunger to kick in after runs last year when I was training, but this time around, hunger has been showing up as soon as I come through the door. And not normal hunger, like FEED ME NOW hunger. Overnight oats topped with coffee cake, granola, peanut butter and I think I spot some chocolate hazelnut butter as well. I had to head to work soon after, so instead of resting like a normal person might do, I whipped up a quick sack lunch dinner to take to work, which I used up all my time on and ended up eating lunch in the car on the way. That seems to happen a lot lately. Leftover veggie burger and sweet potato fries. 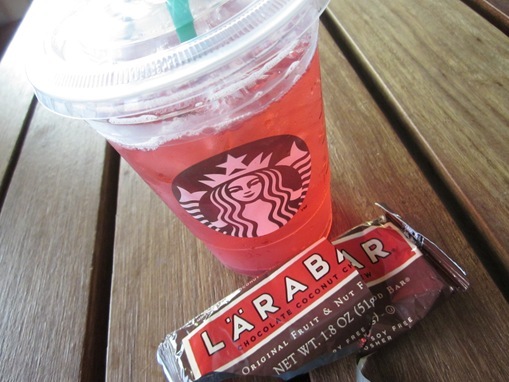 Chocolate Coconut Chew Larabar and my newest obsession: unsweetened passion tea lemonade. I could show you the picture I took of what looked like just salad after I mixed everything up and all the heavy stuff fell to the bottom of the plastic container, but that sounds torturous. Let’s just pretend it looked exactly like this. 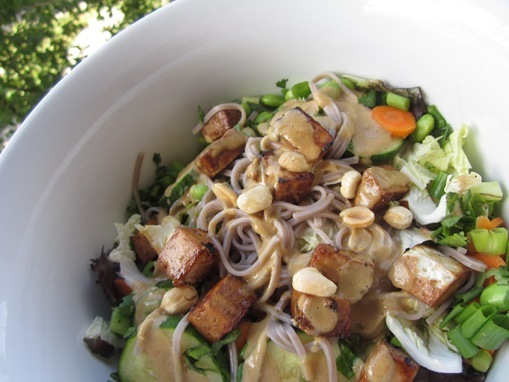 Soba noodles, greens, carrots, edamame, teriyaki tofu and sesame ginger dressing. Except Saturday’s version had more noodles than greens and no peanuts, cilantro or scallions. Okay, no picture but it involved dates and come chocolate chips. And maybe some more peanut butter. Don’t forget to stop by the party! Do you eat differently if you’re had a hard workout? What is your current meal/snack staple? Better question: how can someone NOT eat peanut butter thirty times a day?? And I sorta eat differently if I work out–as in, I’ll make a protein smoothie, and that’s pretty the only time I ever enjoy a smoothie. 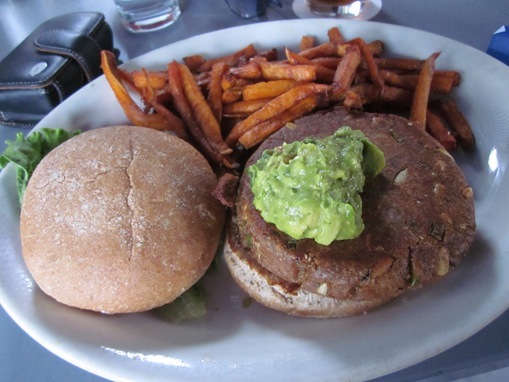 My post-run hunger is more immediate now, too–I wonder why that happens? Great looking lunch AND dinner – I’m jealous. And yes, Sbucks passion lemonade UNsweet is amazing! 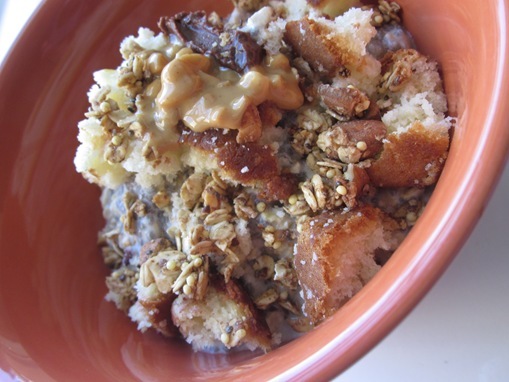 Overnight oats with coffee cake?!! Omg genius! Great eats!! YUM 🙂 happy WIAW! I’m out of hummus and it’s making me quite cranky! Awesome job on the run! I eat so much more on days when I have a hard workout! With cycling, I’m hungry right away. With running, I’m often not that hungry. It can be pretty bad- long runs often take away my hunger and I eat less than I would on a normal day! When that happens, I usually get super hungry the next day or a couple days after. I took a nutrition class last year and we learned that exercise does turn your hunger cues off so it’s important to nourish yourself after a workout even if you don’t feel particularly hungry. I always eat differently if I do a long run. There’s no way I want to not eat back all the fuel I have burned! Another awesome day of eats 🙂 I eat peanut butter multiple times a day as well…..soemtimes you just gotta have it! Awesome run, Lauren! My appetite tends to kind of disappear on days where I have a really hard workout, but it shows up with a vengeance on the day after. I find that, especially since I started lifting, if I wake up with really sore muscles, I can’t seem to eat enough and I’m basically making trips to the kitchen all day. As for snacks, my top 3 lately would be bananas with almond butter, cookie dough balls, and rice cakes topped with almond butter and honey. I’m officially buying rice cakes next time I go to the store after seeing them on your blog so much! Those oats look heavenly. Such a good idea to top them with coffee cake. Hmm, “How many times can Heather eat peanut butter in one day?”…sounds like the title of my life…maybe I should change the name of my blog to Kiss My Peanut Butter! Haha! And as if this comment wasn’t long enough…I just have to say that salad looks gorgeous! What is the sesame ginger dressing that you use? Store-bought or homemade? Homemade, from the Peas and Thank You cookbook!